Bayleigh is a lovely 7-year-old fawn female who comes to GALT as an owner release. She had been in her previous home for about 2 years so she is completely house oriented, very cat friendly and gets along well with other dogs. Bayleigh is very affectionate, loves strangers, almost never barks, and is very laid back. She does not crate at all and has shown some signs of separation anxiety. Eight months ago I never gave Greyhounds a second thought. I was living in Austin and some friends were telling me about a friend of theirs in Dallas, who was fostering a Grey that reminded them of my Great Dane, Maxine. Shortly after this conversation, I was planning a move to North Texas, about an hour from Dallas. My friends introduced me to their friend Nancy, in Dallas. My first visit to Nancy's house was really my first introduction to Greyhounds. Korkie and Xander were so sweet and full of personality and I was very impressed by them. The greatest thing about my move to North Texas was my job. I was working at Texoma Specialty Care Center (TSCC), an Eden Alternative nursing home. The Eden Alternative is a philosophy regarding long term care in which the home creates a "homey" environment for the residents, replacing the traditional sterile feeling. The best way to do this is by having pets in the home. TSCC had three dogs, six cats, and a handful of birds living there. In addition, many staff members brought their dogs to work each day. Not only is this a great environment for the residents, but it also makes coming to work so much more enjoyable for the staff. One morning at a staff meeting, my boss, Donna, brought in a section of the Dallas Morning News and showed us an advertisement about the Greyhound Adoption League and said, "Greyhounds are the recommended dog for Eden Alternative and I want one. We need to find out more about this." I was so pleased to inform her that I knew someone who volunteered with GALT, and I could find out how we could adopt. 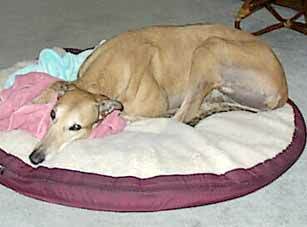 I told Donna and the other staff all about Korkie and Xander's sweet dispositions and how wonderful Greyhounds were. And thus our adoption process began. Nicki, the animal committee representative, came to staff meeting one July morning to inform us that GALT was coming to do a home evaluation and meet our other animals. Meanwhile, Donna and I went to the GALT website to look at dogs we might want. John McQuade and Suzanne Griggs came to see the home. Although they liked our home, they did have some concerns, particularly, the front door. We worked out solutions and before we knew it, we had received a phone call that our application was approved. The day Bayleigh arrived at her new home, I met her outside, and there was this beautiful fawn, with dark brown eyes, terrified and shaking. I walked her in the front door where she was immediately greeted by all the residents and staff. I was overwhelmed and could only imagine what this dog must be thinking. I escorted Bayleigh to Donna's office, where we had a bed and the commotion was less. I sat down on the bed with Bayleigh and remained there the rest of the day, reassuring her that all would be okay. The other dogs came in to see what all the fuss was about. Ruff, a Border Collie, did not seem pleased, but was rather aloof in his usual manner. Jock, a Cocker Spaniel, was eager for this new friend and wagged his tail in approval. Pepper, a black Lab, was not thrilled, to say the least. Pepper was the Alpha and was not interested in having Bayleigh threaten her position of authority. Needless to say, Pepper was not welcoming and gave us all some concern about leaving them alone at night without close supervision. Donna asked if I could take Bayleigh home with me at night until she was a little more comfortable in her surroundings. I was thrilled since Bayleigh and I had already begun to bond. That first night at home, Bayleigh relaxed immediately and began to let her personality show. I let her out in the yard where I witnessed the beauty of her stride as she ran laps. We went for a walk and she proved how well she did on a leash. Then she curled up in her bed and slept quietly throughout the night. By the next morning, I had become attached and was in love with this dog. Bayleigh was my constant shadow all that week. We moved her bed into my office. Neither Pepper nor Bayleigh were thrilled with each other, but Bayleigh proved that she wouldn't back down and slowly Pepper backed off. Bayleigh came home with me that first weekend. I wasn't ready to give her up yet and because I was now the "resident Bayleigh expert" I said she wasn't ready to stay overnight at the home. I knew that Bayleigh had to make the transition. At the end of the day Monday, I passed off Bayleigh to Chris, an evening shift nurse who agreed to keep a close eye on Bayleigh. I had to hold back tears as I left the home and called several times that night to check on her. Each afternoon, for the next several days, Chris and I would compare Bayleigh anecdotes. Bayleigh was not sleeping in her bed, but instead, on the hard floor in the living room. I realized that she did not like being alone at the end of the hallway and preferred to be with others. So each day, when I left, I would move her bed to the living room, close to the front door and the nurse's station, where she could be in constant contact with others. I placed another bed in the Director of Nurse's office because I wanted to wean Bayleigh from my side. I was leaving for vacation and worried that she would panic without me. I was so excited to get to work that first morning after my trip. Bayleigh was in the living room to greet me. She pranced around, wagged her tail, and licked my face. I couldn't believe how much I had missed her, and was thrilled that she missed me too. In my absence, Bayleigh had grown more independent and comfortable in her new home. She had at least one person on each shift that she was close to and was becoming more relaxed around the home. I was sad that she wasn't my shadow, but happy that she was fitting in. I moved her bed, permanently, to the living room so she could enjoy attention from so many people. Although she belongs to the home, everybody would seek me out to report new and funny Bayleigh stories or to inquire about greyhound personality traits. One morning I came in and was greeted by a staff member who had to show me what Bayleigh had done. We walked out to the backyard and there she was, digging a hole to China. The dirt was flying out behind her and she was too busy to even notice me standing there. When she completed her dig, she positioned herself in the hole and kept herself cool from the summer heat. She even shared with the other dogs when they realized what she had created. A few days later, I heard that during the night, one of the nurse's boyfriends came in the front door at 1 a.m. Bayleigh, knowing that nobody should be coming in at that time, began barking. She rallied the other dogs and they held this man at the door until a staff member could calm the dogs and assure them that all was okay. Bayleigh, on several other occasions, has proven to be quite the watchdog, which was more than we bargained for. After two months, Bayleigh seems like she has been there forever. The dogs love to try and catch her while she runs her laps, and Pepper even joins in when she spots a squirrel on the other side of the fence. Most of the cats don't pay any attention to her except for Tuffy. Tuffy has been spotted sharing Bayleigh's bed for an afternoon nap or enticing Bayleigh to play by swatting at her tail. Bayleigh pokes her long nose in Tuffy's belly as he lays on the floor at her feet. Bayleigh doesn't seem to mind he is a cat and just enjoys his company. I have now taken a new job in Florida. For a month I joked with Donna about letting me take Bayleigh, knowing that she would say no, but hoping she might say yes. Leaving that wonderful home was very difficult, but nothing was as heart wrenching as saying goodbye to Bayleigh. On my last day, I was sitting in the living room near Bayleigh. I was getting ready to give her a last big hug, when an evening shift staff member walked in. Bayleigh was so excited to see her. Her tail wagged and she pranced around and followed Patricia to the dining room. My heart ached. I felt I had been replaced. I had to be strong because I knew this meant Bayleigh was settled. I think of Bayleigh often and miss her tremendously, but am comforted knowing that she is home where she is loved by so many.